Followers of this blog know that I write about all aspects of language, literacy and children's literature. 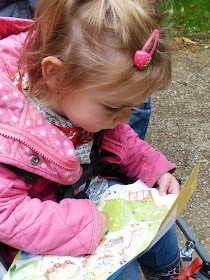 I often review literature to be read by or shared with children. 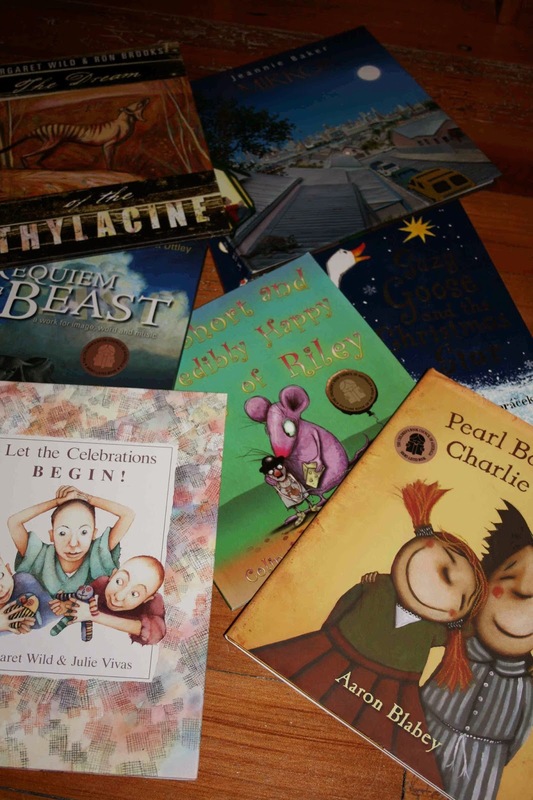 But in this post, I want to share some of the great books that I receive that I'm sure adults and lovers of kids' books will enjoy. There might even be a great present here for a teacher, parent or grandparent you know. 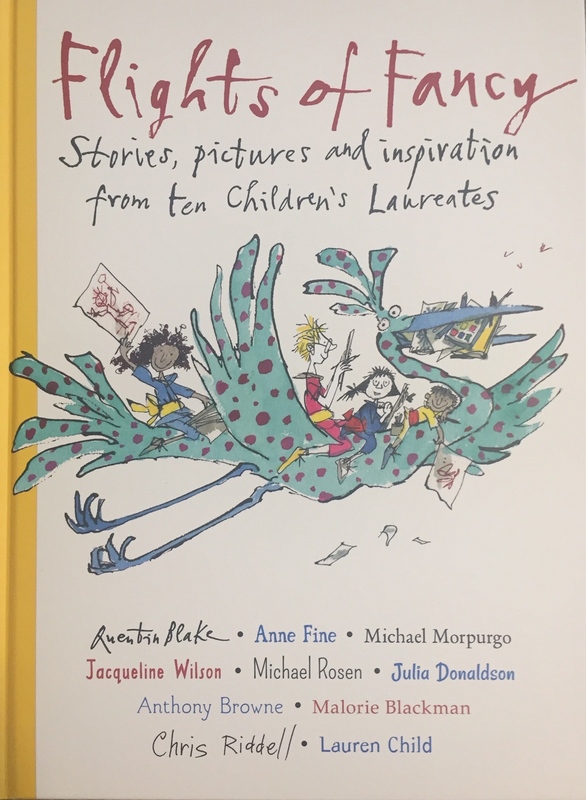 This wonderful book from Walker Books profiles the inspirational work of 10 well-known British writers of children's literature. With household names like Quentin Blake, Anne Fine, Anthony Brown, Michael Rosen, Julia Donaldson and Michael Morpurgo this is a remarkable group. These well-known storytellers through words and pictures, are the first 10 people to have been appointed in Britain as Children's Laureate. This is a two year appointment that recognises outstanding achievement in children's literature. What I love about the book is that each chapter offers a little of the background and work of each person, and a unique twist each time on what they share. For example, Qentin blake shares some unusual large scale "splatter creatures" and talks about his experimentation with images. On the other hand, Anne Fine shares much about her home library and her love of bookplates. Michael Morpurgo offers an insight into his writing processes, Michael Rosen plays with words to say great things about poetry (no surprise there), Anthony Browne draws some of the other laureates, and so on. This is a wonderful feast of insights into writing and illustration by giants in the field. Now this might just be written for children, but I doubt that any grandmother will be able to put it down without laughing. This clever French writer illustrator, gives us an insight into just how diverse 'grannies' are. Did you know there are Grannies in ski suits, some who love nature, surfboard riding Australian grannies, young grannies and old ones? Every grannie has a nickname like 'Mimi', 'Abuela', 'G-ma', 'Meemaw' and more! It's amazing what grannies do with their time - talking, opening oysters, getting names muddled, tempting us with cream buns and more. Grannies seem to know a lot of things that will surprise you (and maybe some grannies). Their wisdom and sayings are priceless! Some grannies knit cardigans for people, covers for cat tails, warmers for camel humps and even gloves for snowmen. Then of course, there is much to learn about the moods of grannies. And we mustn't forget about the travel of grannies and much, much more. 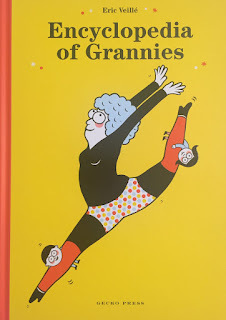 A great book for grannies to enjoy alone or with someone on their knee! Any adult who loves poetry will love this graphic novel, and you'll look cool with your teenage grandchildren or students! Hind has taken some of the best-known works from Edgar Allan Poe and transformed them into illustrated works. Gareth Hind is well-known for his own work with graphic novels and this book won't disappoint. While Poe's work might seem challenging to some, Hind's treatment of the poems and stories might well get some teenagers (and maybe adults) across the line to love these works. In “The Cask of Amontillado,” a man exacts revenge on a disloyal friend at carnival, luring him into catacombs below the city. In “The Masque of the Red Death,” a prince shielding himself from plague hosts a doomed party inside his abbey stronghold. A prisoner of the Spanish Inquisition, faced with a swinging blade and swarming rats, can’t see his tormentors in “The Pit and the Pendulum,” and in “The Tell-Tale Heart,” a milky eye and a deafening heartbeat reveal the effects of conscience and creeping madness. 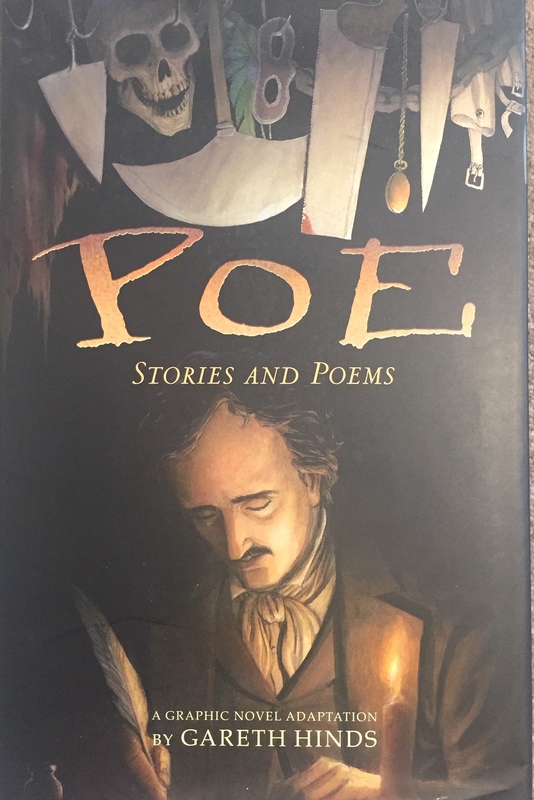 Alongside these tales are visual interpretations of three poems — “The Raven,” “The Bells,” and Poe’s poignant elegy to lost love, “Annabel Lee.” The seven concise graphic narratives, keyed to thematic icons, amplify and honor the timeless legacy of a master of gothic horror. Some might be offended by a few word changes, but these are limited and do little more than shorten some sentences and occasionally connect others. The majority of the text used within the graphic novel format is verbatim, but the illustrations alone will make it come to life. Adults will enjoy the book and will have some fun discussing it with their students, children or grandchildren. This is the book for the would-be writers (just about everyone!). 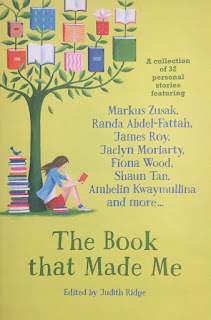 It is an edited book that contains 32 personal stories from children’s and young adult authors as they explore the books, stories, and experiences that changed them as readers. 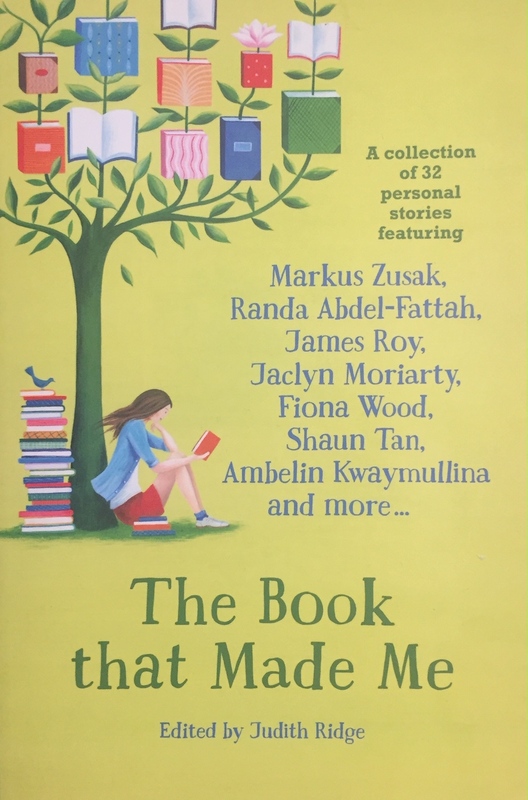 The authors include Shaun Tan, Simon French, Jaclyn Moriarty, Ursula Dubosarky, Catherine Johnson, Julia Lawrinson and Jared Thomas. What was the book that made them fall in love, or made them understand something for the first time? What was the book that made them feel challenged in ways they never knew they could be, emotionally, intellectually, or politically? What book made them readers, or made them writers, or made them laugh, think, or cry? This one looks a bit more like a text book, but the short chapters are rich in experiences and insights into each author's life as well as their formative literary experiences. 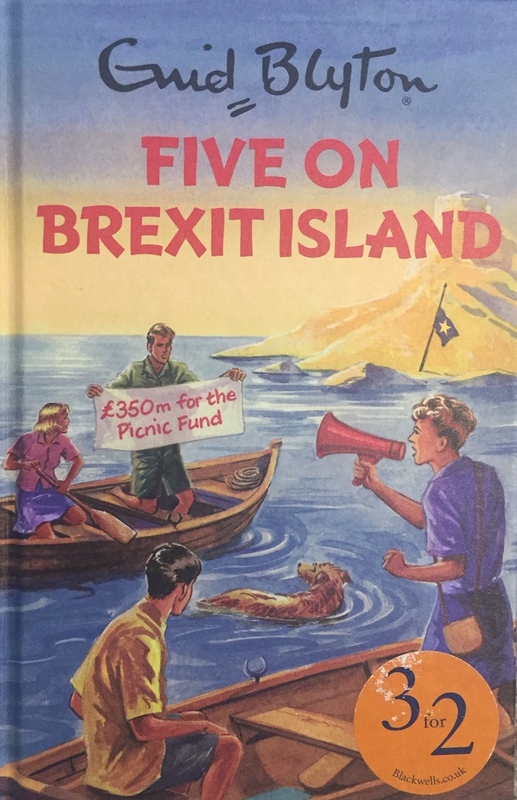 I bought my copy of 'Five on BREXIT Island' last year when in London. I just couldn't resist. Only the fear of excess baggage made me leave some of the other titles on the shelves. This is of course Enid Blyton with a serious twist. Obviously, Enid Blyton for grown-ups or thoughtful teenagers. In a way, this book in the series has been made even better by the 12 months of political chaos in Britain over the exit from the EU. The story starts on the night of the referendum. The Five are gathered relaxing on Kirrin Island. Julian has politics on his mind. He steps forward and clears his throat. "There's been a lot of scaremongering going on," he said, "about the potential consequences of this vote: about subsidies, about people's livelihoods being threatened, about the economy and about hope in the future." He implores the gathering to fight for the values of the Island. For of course, "... Britain is great, and Kirrin Island is great too - and they are better - together!" Hopefully, this will whet your appetite. Other titles include 'Five go on a strategy away day', 'Five go parenting', 'Five give up the booze' and one for the ages, 'Five go gluten free'. Some kids refuse to read, others won't stop - not even at the dinner table! Either way, many parents question the best way to support their child's literacy journey. 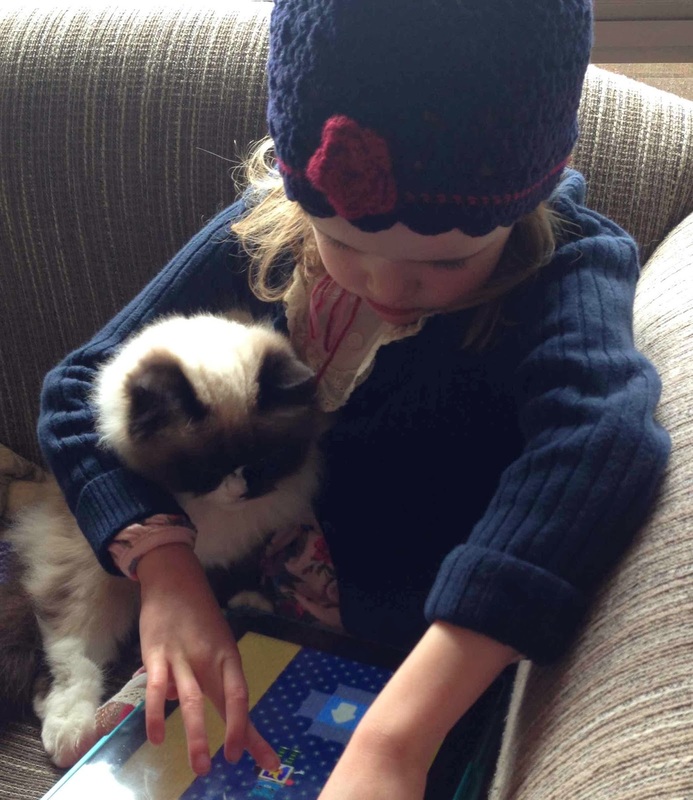 When can you start reading to your child? How do you find that special book to inspire a reluctant reader? How can you tell if a book is age appropriate? What can you do to keep your tween reading into their adolescent years? Teacher librarian Megan Daley has fifteen years of experience and shares many of her in sights. Her opening chapter has some great advice on "raising a reader" in the years 0 to 5. Later chapters have good advice on the nature of reading, where technology fits, getting the most of out of a library and setting up the library or a classroom. There also excellent chapters on a balanced diet of varied reading genres (historical fiction, fantasy, science fiction, plays, poetry, novels and more). As well she tackles multimodal and digital reading and books that reflect cultural diversity. You'll find lots of practical tips, suggested reading lists and things as practical as how to run book-themed activities. The book is a great resource for parents and educators. Oral Reading: Making it Useful or Making it a Waste of Time? Oral reading is often the 'go to' strategy for many classroom teachers teaching children aged 5-10 years of age. But while it is an essential tool for teaching the very young beginning reader, it can be badly used and even abused at school and at home. Furthermore, while it might well be an appropriate way to assess reading for beginning readers aged 4-7 years, it isn't sufficient to properly assess proficient readers, nor to act as a core part of literacy instruction for children with reading ages beyond 7 years (irrespective of the grade they are in). 1. How can oral reading be useful? Help teachers and parents to observe and make 'visible' children's reading processes (to some extent what's going on in their heads). Help children to develop reading fluency and can support vocabulary development. Help teachers and parents to assess reading progress and diagnose difficulties. Be a helpful skill for life that we don't want to lose. 2. How can oral reading be abused? While oral reading does have some helpful functions, it should never be assumed by parents and teachers as the key tool for reading assessment and instruction. Sadly, for many children, reading around the group (or worse still the class) kills interest and motivation. What's even worse, at times oral reading can be used as the only tool to assess the ability of young readers with little attention to comprehension. Just listening to children reading is NOT an adequate tool for assessment. While some young readers might struggle with oral reading, they might possess excellent reading comprehension skills, extensive vocabulary and greater reading fluency when reading silently. But we also know from research that 'repeated readings' can improve fluency and ability (e.g. Stoddart & others 1993, Rasinski 1990, Rasinski & Hoffman 2003). So it has a place with young readers, but not as the key instructional and assessment tool. My key question for teachers is how can they move beyond 'round robin' reading and embrace more creative and enjoyable approaches to reading? First of all, we need to ensure that children have frequent opportunities for silent reading and opportunities for response, discussion and comprehension tasks. Second, if using oral reading or repeated reading make it interesting and supportive of learning? Here are some key elements to help achieve this. 1. Choose appropriate material for your children - use graded material at varied levels; favourite passages from books the class has heard or read (e.g. Roald Dahl or Dr Seuss books work); jokes & riddles; poetry or songs that they know; speeches and famous quotes. 2. Ensure that students are reading at their appropriate level. 3. Use varied strategies and avoid simply reading around the group. 4. Try to give the oral reading task an 'authentic' rather than contrived purpose. What are some simple novel ways to help children remain motivated and enjoy oral reading? i) Read to prepare for performance - By this I mean, putting exciting material in children's hands, letting them practice and then asking them to share it with a group or the class (e.g. read a favourite section from a book, read a song, silly poem etc). ii) Try Readers' Theatre - I've written about this before (HERE). 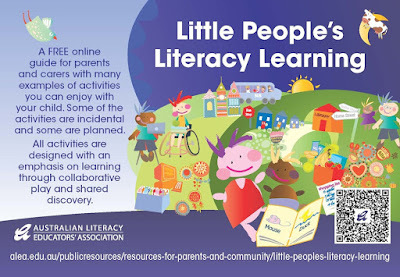 Obtain some free scripts and let your children have fun reading together in small groups to present the scripts to others. 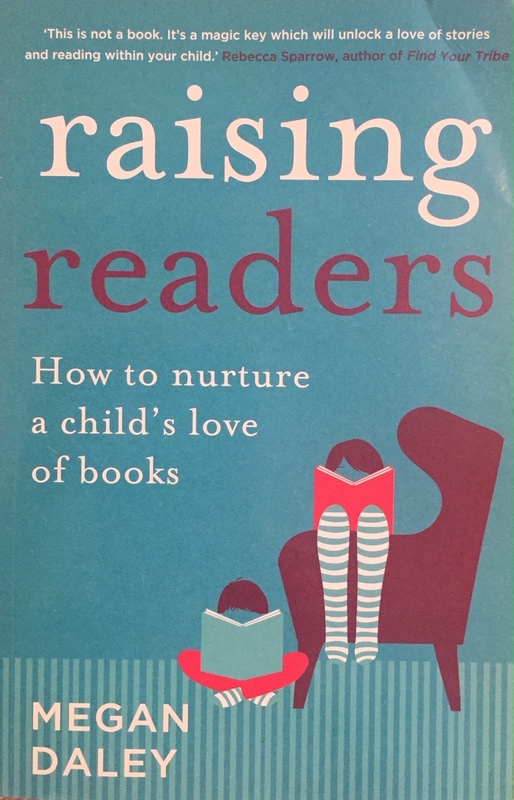 iii) Read to someone or something - This might seem strange, but some teachers get their children to read not to other people but to other 'things'. A number of classes in the UK and the US have had children read regularly to a school dog (read more HERE) with great success and benefits. Some creative teachers have had their children read to plastic dinosaurs (! ), a favourite doll etc. iv) Some turn it into a game such as 'Reading Dice' - This involves getting children to discuss the different voices a character could have for a reading extract; they then write 6 of them on the board and giving them the numbers 1-6. They then have children work in pairs or groups to take turns, roll the dice and use the voice that matches the number. v) Newsreader or media presenter - Teachers have a microphone (it can be a fake one) and ask children in pairs to conduct an interview for an appropriate extract. vi) Reading Masks - the children practice reading passages using the voice and persona of the mask they are wearing (these can be animals, super heroes etc). Oral reading is a valuable instructional tool but should NEVER be used as the sole instructional or assessment tool. It has been misused for many years with the effect that some children have found it less than rewarding. But it can and should be enjoyable and fun. I'd love to hear of your own experiences with oral reading. Do you have any great ideas? Post a comment. Mary Ann Cahill & Anne E. Gregory (2011). Putting the fun back into fluency instruction, The Reading Teacher, Vol. 65, No. 2, pp 127-131. I've had a number of wonderful picture books arrive recently. 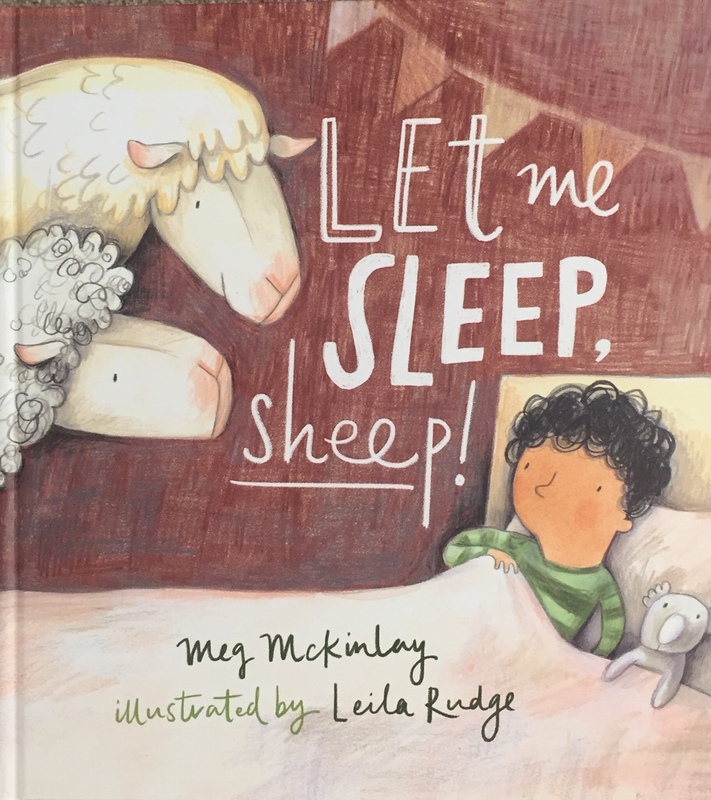 Here are 10 that are perfect for bedtime, reading to classes or groups of children, or also as great new self-reading for children aged 3-7 years. Matt Shanks’ latest picture book introduces us to Celine Beaufort. 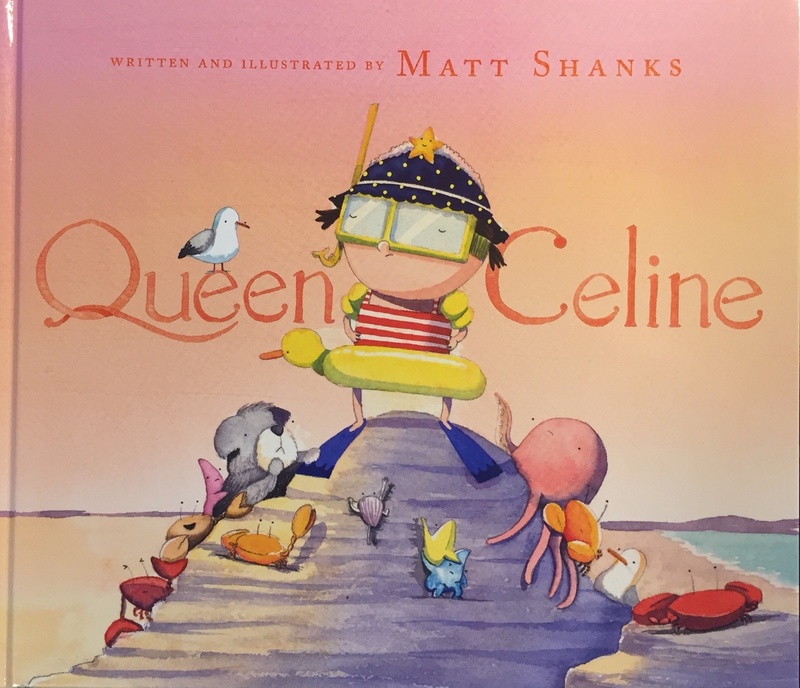 Celine lives a fairly ordinary life, doing ordinary things, but sometimes she gets to be the queen of a very special place—her very own kingdom by the sea. But when Celine claims the land for her own and builds a fortress to keep everything else out, the kingdom starts to lose its magic and Celine realises she’s made a terrible mistake. I love this simple but subtly complex tale. It's water colour plates are a joy in themselves (hope you enjoyed the video of our artist at work). But like any great picture book, 'Queen Celine' has many layers of meaning. It can be read as a funny story about an ordinary little girl, who messes up badly in trying to protect and claim her own bit of paradise. She was an ordinary little girl, who did pretty ordinary things. But she has the chance to make herself a Queen with a kingdom by the sea! This picture book can also be read as a book with significant ecological messages. And if you consider it for a little longer, you might just see another layer that has political messages about a self-proclaimed ruler - Celine! It was her kingdom, she had 'bagsied' it for herself! She was to control the boundaries of her special kingdom. This reading could imply that there is another political path that doesn't keep all things to ourselves in order to protect and enjoy them. Is it possible to share good things with others without losing out ourselves? Indeed, might this generosity of spirit be better. 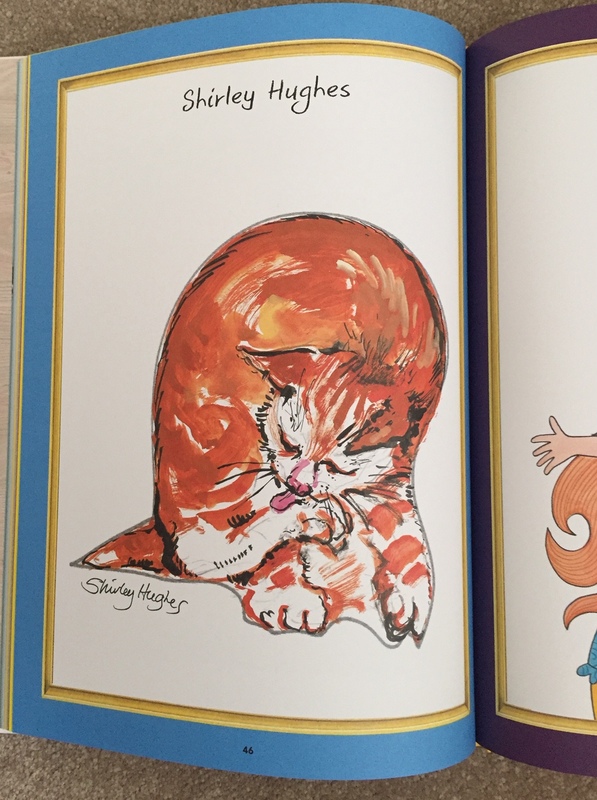 A brilliant book that combines delightful water colour illustrations with a well-crafted text that packs strong messages with a minimum of words. Wonderful stuff! Suitable for children 3-7 years. I just love this book. 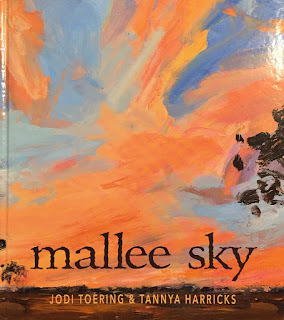 Tannya Harrick's wonderful oil paintings with rich almost extravagant brush strokes bring the Australian countryside to life as few books manage to do. Each plate is so authentic I was transported to many rural locations that I've experienced. The rich beauty of trees in sometimes barren landscapes, the colour of Australia's amazing birds and the authentic images of remote towns. Tannya understands this landscape and helps us on the journey which Jodi Toering has beautifully crafted in words. The beauty and harshness of remote Australia is so well described by the author. As well, the life is captured so subtly by the images of milk urn letterboxes, showers in the paddock, dust storms, harsh drought and the glorious excitement of long awaited rain. Jodi was born in the Mallee at Hopetoun and grew up on a wheat farm outside a small town called Beulah, and it shows! No doubt this is why she had deftly written a moving account of the effect that drought has on families and communities. But she also enjoys in her spare time creating artworks based on her bush block. Tannya on the other hand lives in the city, but her love of the Australian landscape shines through in the joy and exuberance of her art. It won't surprise you to know that she is an award-winning visual artist/painter based in Sydney. Her paintings are derived from sketches done out in the landscape and brought to life in the studio. The book is a veritable gallery of stunning paintings worthy in their own right. Together, writer and artist have created a wonderful book. Don't miss it!. Suitable as a self-read for children aged 5-7 and a read aloud for children aged 3-10. Liam and Kai are the best of friends. They do everything together. Each day in the park they race around in their box cars, pretending to be everything from policemen chasing down bad guys to chauffeurs driving around movie stars! One day they notice a little girl watching them -- she's keen to join in and they're happy to be her friends too, but with only two box cars to play with it seems someone's going to be left out. 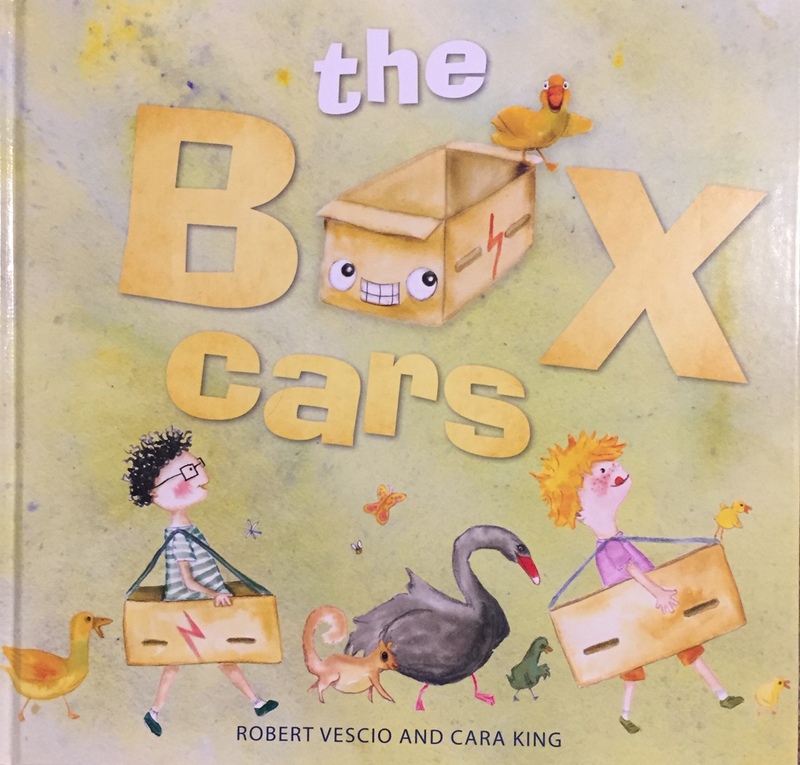 The Box Cars is a fun-filled story of friendship, sharing and creative problem-solving that will appeal to boys and girls everywhere! This is a lovely book for younger readers aged 4-7 years to read or as a read aloud book at home or school. Cara King's quirky and delightful illustrations will captivate your readers and listeners. Robert Vescio offers a sensitive exploration of how children can learn that relationships with friends don't always need to be between two special best friends. There can be a generosity in friendships that might just enrich the existing relationships that you have, if you're prepared to open your lives to others. This is a wonderful exploration of how we can deal with the old 'problem' of two's company, but three's a 'crowd.' 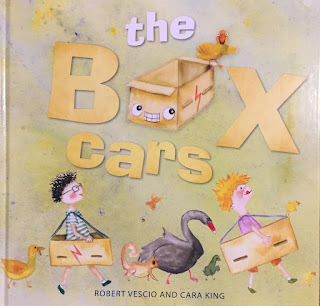 A beautifully crafted text from Robert Vescio and wonderful illustrations from Cara King work so well together. This is another wonderful book from a small publisher (Exisle Publishing) punching well above its weight! This new book is also a wonderful celebration of creativity, ingenuity and simple fun that children can make for themselves, if given the opportunity, time and access to basic things. Sophie absolutely adores Jimi and smothers him with treats. She thinks he has everything a cat could possibly desire. And Jimi does ... but he doesn’t ... because secretly Jimi longs to explore the bright and bustling world outside. So, when Sophie rushes out one day forgetting her keys, there’s only one thing for it: Jimi slips on his coat and skedaddles out of there, too! Where will he go and who will he meet on those wild and exciting streets? And what on earth will Sophie say? Children and parents alike will rejoice in this funny, stylish and heart-warming celebration of freedom, adventure, friendship and love. Flat Cat is a very creative exploration of a basic human reality; in life at times we need to take a few chances, and break a few rules. 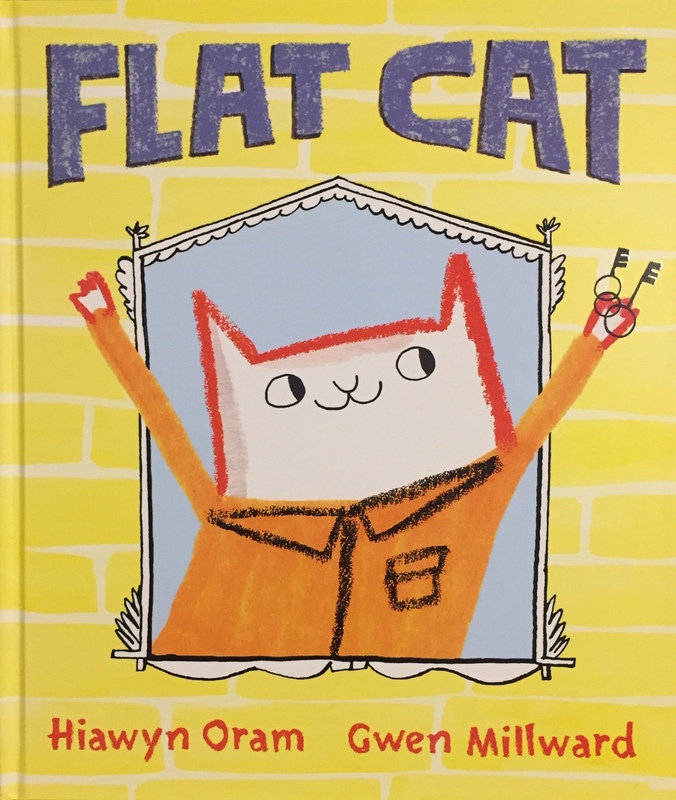 Gwen Willard is a clever illustrator who takes a 'one-dimensional' cat and turns him into a risk taker who changes the direction of his life. 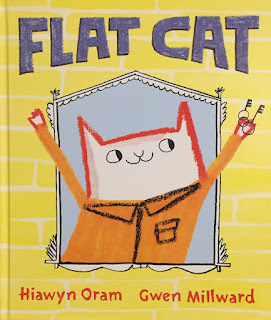 Willard's simple crayon line drawings are simply captivating and work perfectly with Hiawyn Oram's clever story. A perfect read aloud for children aged 4-7, or a fun read for younger readers. 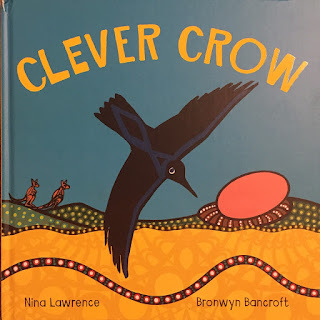 Clever Crow is an endearing and witty tale that follows the exploits of a hungry and very clever crow. Crow searches in the bush for food but he can find none. It is only when he comes across people preparing for a ceremony that his luck changes. Crow spots a big turtle egg waiting to be cooked, and he cries out, 'Yummy, food for me!' But it is not an easy task stealing a turtle egg - even for a clever crow. Crow has to be more clever than he has ever been before! I'm a big fan of Magabala Books, and Indigneous Publisher located in the beautiful town of Broome located in the remote North West coast of Australia. Nina is a descendant of the Yidinji people of Far North Queensland and Bronwyn is a member of the Djanbun clan of the Bundjalung Nation. This telling of a traditional Aboriginal story is presented with English and Indigenous languages complete with a wonderful glossary included. Children will love Bronwyn Bancroft's colourful and evocative illustrations, and the way the Djambarrpuynu language translation (Yolnu language from North East Arnhem Land) is woven into the design of this wonderful book. Sally and Max love dinosaurs. They can’t wait to see them at the museum, but today the dinosaur exhibition is closed. Where will the dinosaurs go on their day off? A whimsical story with humour and heart from author and award-winning illustrator Sara Acton. They visit their favourite museum where they love to look at the dinosaur skeletons, but this day the exhibition is closed. The dinosaurs have a day off! Outrageous. 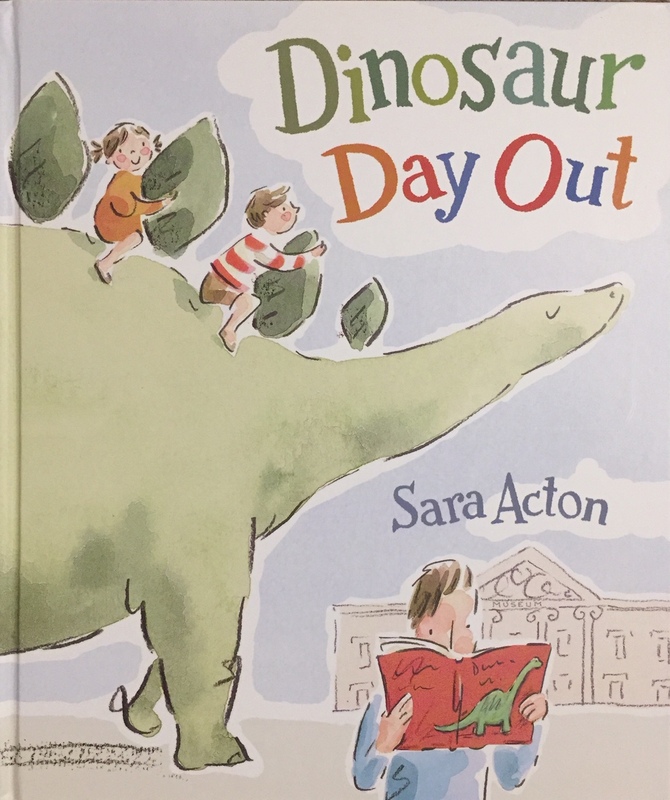 But as the children explore the city and the museum they gain a glimpse of just what dinosaurs might do on their day off. Sara Acton's crayon and watercolour are stripped back as is her beautifully economical text. Sara of course is the Crichton Award-Winning Author/Illustrator of 'Ben and Duck'. Sara grew up in The Cotswolds, England, and trained to be an art teacher in London. After teaching stints in London and New Zealand, she moved with her family to Australia. This fun book would be a perfect read aloud book for any group of 4-6 year old children. 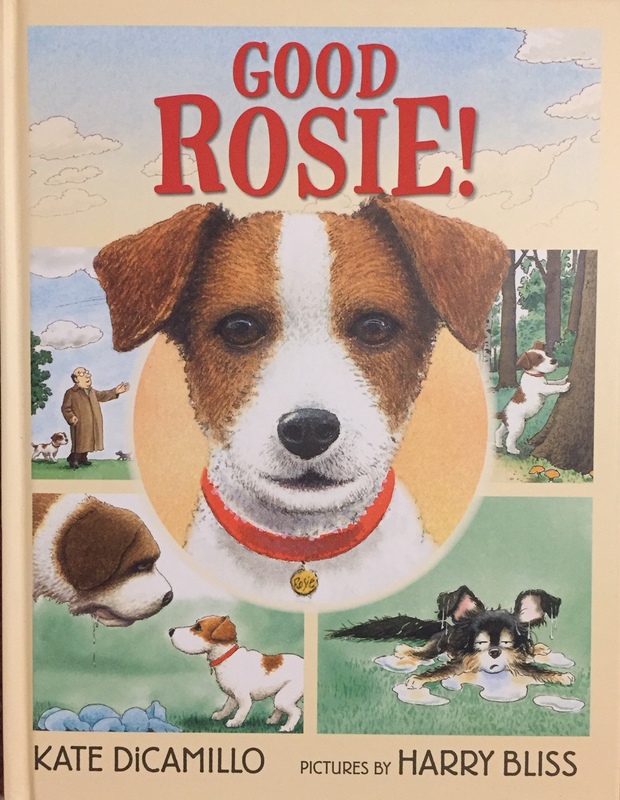 Rosie is a good dog and a faithful companion to her owner, George. She likes taking walks with George and looking at the clouds together. But the closest she comes to another dog is when she encounters her reflection in her empty dog bowl, and sometimes that makes Rosie feel lonely. One day George decides to try taking Rosie to the dog park, but the park is full of dogs that Rosie doesn’t know, which makes her feel lonelier than ever. So, when big, loud Maurice and small, yippy Fifi bound over and want to play, Rosie’s not sure how to respond. Is there a trick to making friends? And if so, can they all figure it out together? Kate DiCamillo is a legendary story teller. The author of 'The Magician's Elephant', a New York Times bestseller, 'The Tale of Despereaux', which was awarded the Newbery Medal, and 'Because of Winn-Dixie', a Newbery Honor book. Harry Bliss is a cartoonist and cover artist for the New Yorker magazine. He has illustrated many picture books, including illustrated many picture books, including the New York Times bestselling series by Doreen Cronin: 'Diary of a Worm', 'Diary of a Spider', and 'Diary of a Fly'. Bliss makes a wonderful visual contribution to this work. Together they have created a memorable picture book, that looks a bit like a graphic 'novel' or comic book. But it is essentially a picture book. This is a picture book that many readers aged 5 to 7 years will read over an over again. 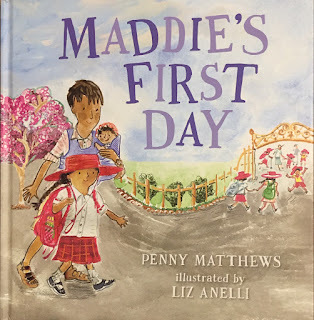 It is Maddie’s first day of school and she has everything ready – her uniform, shoes, socks and hat. But there is one special thing that Maddie can’t leave behind – her blanky! This is a perfect book for children aged 4-7 who still have some insecurity in new situations. It tells of the insecurity that can creep in during the early weeks of school, whether kindergarten or simply the start-up of a new year. 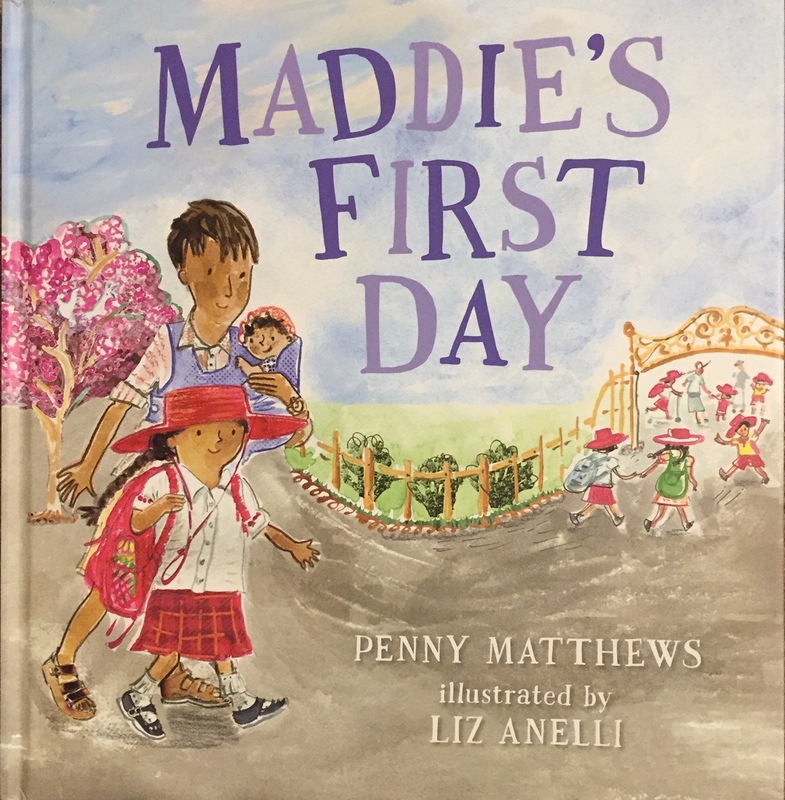 Penny Matthews and Liz Anelli team up to tell this sensitive story of a little girl who sneaks her favourite 'snuggle' toy into her bag on the first day of school. 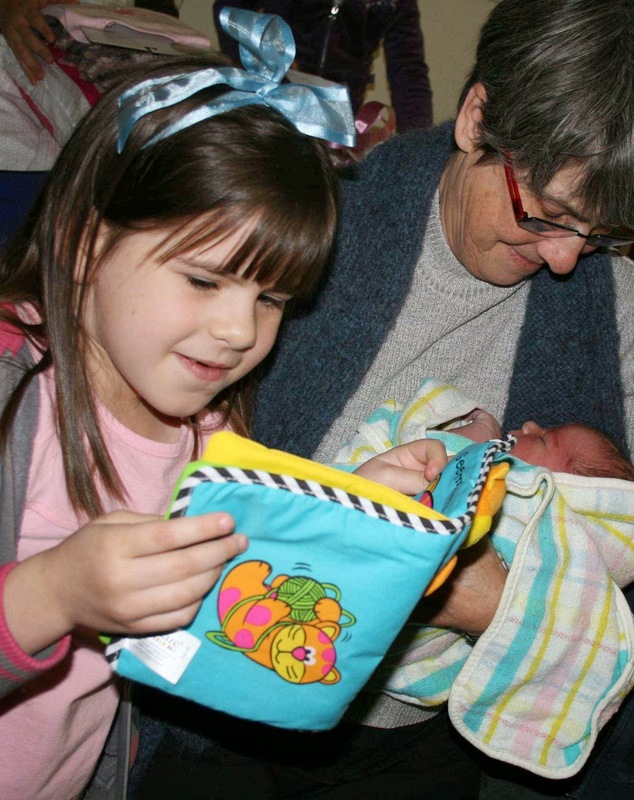 While some classmates are surprised to see her 'Blanky' at school, Charlie understands because he had his 'blanky' too. A rich friendship develops as they adjust to school life together. This would be a perfect book to share in the first weeks of Kindergarten or in the lead up to those first days at 'Big School'. When a young girl has to travel to a new country and start at a new school, her Fear tells her to be alone and afraid. How can she hope to make friends if she doesn’t understand their language? This is an intriguing picture book. Sanna is the author/illustrator of 'The Journey' which was a 2017 Amnesty CILIP Honour book and recounted a family's dangerous flight from their home in a war zone to a new country. This book is similar in artistic and literary style. In fact, they are unmistakably related. 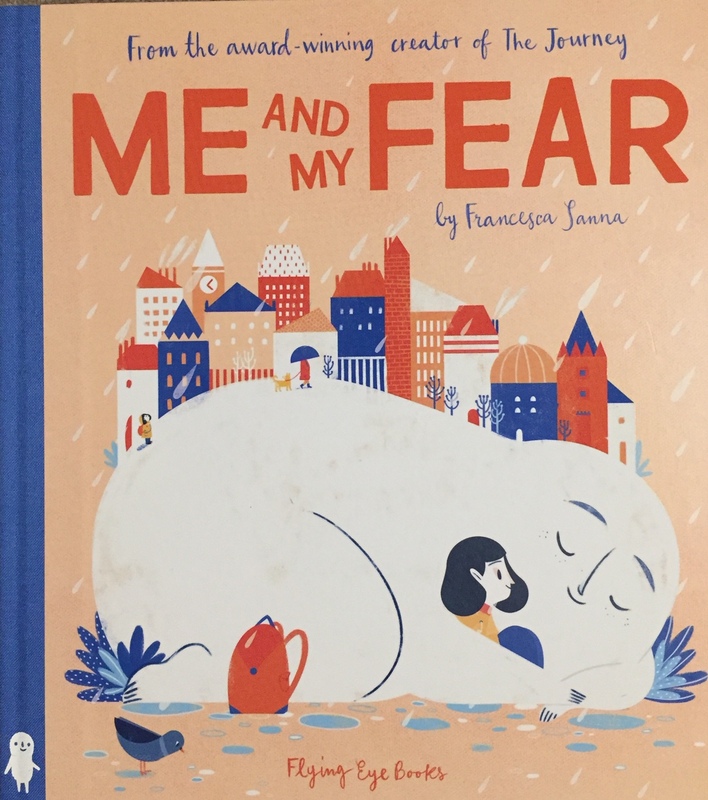 It is a heart-warming tale that grapples with the importance of dealing with your fears, and in particular, the importance of sharing them with others. Sanna understands that we all have fears within us, even this unnamed little girl. 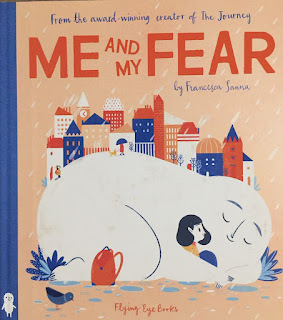 The little immigrant girl might well be Francesca herself, for she shares in the author's note at the back of the book that she is an anxious person, and that she has needed the help of many people to deal with anxiety. Fear shows itself in many forms and can be debilitating. But fear leading to anxiety, can also be our "friend" that seems to sit 'in our pocket' 'keeping us safe'. Fear might not be all bad, if we know how to deal with it. And if we are given support in doing so, it can be controlled in positive ways. Our fears might seem to get bigger and BIGGER by the day, but the can be our friends if they can be kept in perspective. Fear can take many forms; fear of a new neighbourhood, playtime at school, not understanding others, mealtime and plates that seem too big' dreams' or not having friends. This lovely book, with distinctive illustrations created with a simple subdued colour palette, allows the reader to identify with this unnamed little girl and the emotions portrayed. And our 'cloud-like' friend 'fear' is drawn in an appropriate non-scary way, suggesting that it can help not just hinder. Francesca Sanna is an Italian illustrator and graphic designer based in Switzerland. Following her studies in Cagliari (Sardinia), she moved to Germany and then Switzerland, in order to follow her dream to work as an illustrator. The dynamic, 'dream team' of Jon Klassen (illustrator) and Mac Barnett (author) has come together again for the final instalment in their hilarious 'Shape' trilogy. They have made six books together: 'Sam and Dave Dig a Hole', 'Extra Yarn', 'The Wolf, the Duck and the Mouse', 'Triangle', 'Square' and this their latest book 'Circle'. Jon was the creator of the much-acclaimed 'Hat' trilogy, which includes 'I Want My Hat Back', the Kate Greenaway and Caldecott Medal winner 'This Is Not My Hat' and 'We Found a Hat'. They both live in California, USA, but in different cities. Jon is originally from Canada. 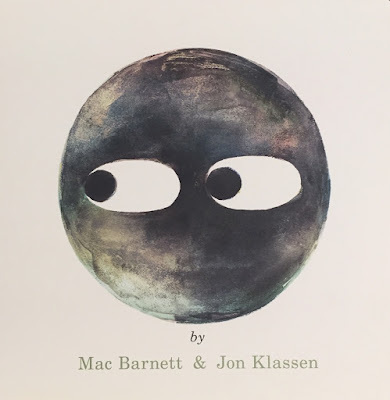 Jon Klassen in Shape trilogy, almost seems to echo the famous Swiss sculptor Giacometti who sought to represent the human head (and later bodies) with as little detail as possible. And yet, his plaster heads still unmistakably represented heads. Klassen's incredible geometric shaped people of course sit within illustrated backgrounds, but the 'reader' is always drawn to the head. In this third book of the trilogy, Triangle and Square are visiting Circle, who lives near a waterfall. One day they play hide-and-seek, and Circle gives them just one rule, 'no hiding behind the waterfall'. Why? Because "it is dark back there". But where do they go? Square stays behind because he's afraid of the dark. But Triangle hides behind the waterfall. Circle goes to find him, there is no answer. He goes deeper in and it is VERY dark! Only his eyes are now visible. Circle finds Triangle (and he is glad), but there is a third set of eyes! Who could it be? No, not Square, he's outside. So, who is it? What shape do you picture? Brilliant as usual, you will be left wishing that this trilogy didn't have to end. I just live these books, which will always be seen as picture books that have helped us to rethink just what they might be. Every child should have access to this series. Suitable for readers 1-99 years! But also, perfect for a read aloud to children aged 3-6 years. It’s bedtime for Amos, who smiles as he closes his eyes and counts some fluffy sheep trotting away in the grass. Until suddenly . . . THUD. And then another. “Not again!” says the first sheep, now on Amos’s floor. “I was having my wool clipped,” grumbles the second. None too happy at being interrupted, the woolly pair fire a battery of questions at Amos, most importantly: "Where’s the fence?" The fence!? The sheep has a name Felix, not "one" and he the two sheep will be there until they find the fence. Amos will need to build one. But what can he use? The shelves? No, it's too high and Felix's friend Walter has a bad knee, and Judith, who is as yet un-arrived sheep 7 hates heights. Amos sets out to build one to their specifications, then of course he'll need to test it. This is a very funny and clever book that readers or listeners aged 3-7 will find hilarious! 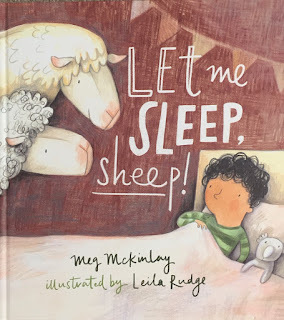 Meg McKinlay is a wonderful writer and Leila Rudge is a brilliant illustrator. Her soft and colourful crayon illustrations are 'delicious'! This great team has created a very special book. It follows on from the previous success of this partnership with 'Duck for a Day' and 'No Bears'. Natalie and Alphonse REALLY like books. 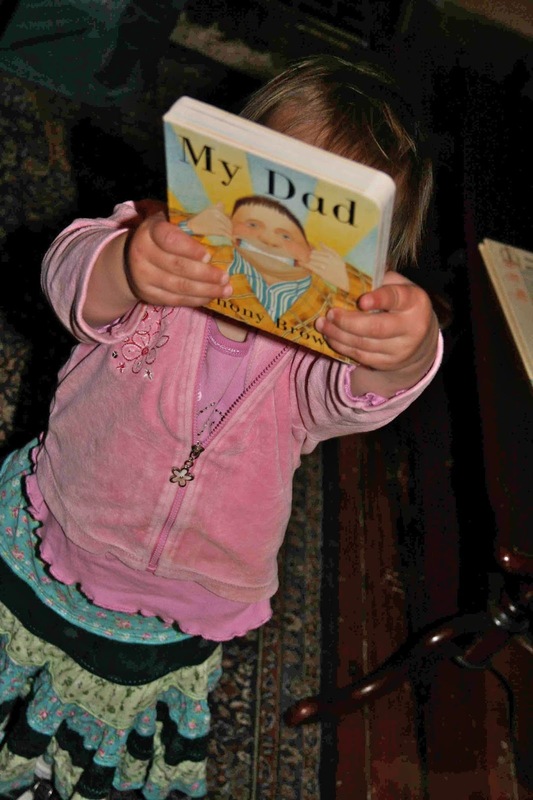 Picture books with Dad, scary stories with Mom, and especially stories they remember or make up themselves. So, when it’s time for Natalie to learn to read, she thinks it will be exciting — she can have all the stories in the world now, and even read them to Alphonse. But when Natalie gets her first reading book, the letters look like squiggles and it isn’t even a good story; it’s just about a cat that can sit. “I do not like books anymore!” Natalie declares. But she still wants to make up stories. With Alphonse’s help, can she find a way to turn a love of telling stories into a love of reading stories? With her one-of-a-kind voice and wonderfully droll artwork, Daisy Hirst captures the familiar frustration of struggling to learn something new — and the particular pride that comes when you finally succeed. 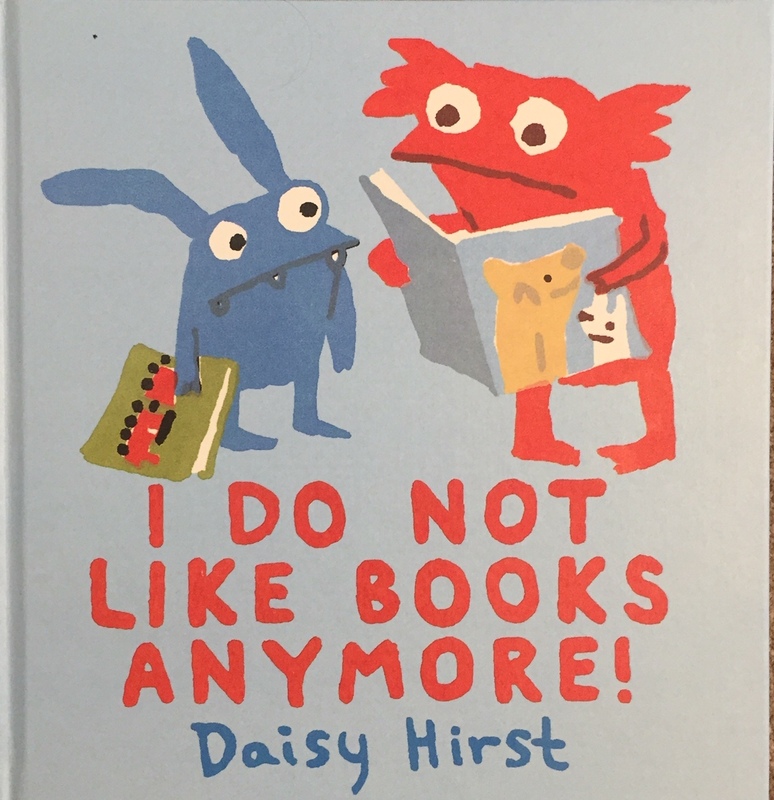 Hirst's cartoon-like style will be endearing to younger readers, with simple brightly coloured stylistic figures and bright colours they seem just right for this quirky tale. The story will parallel the experience of many children who start out loving the joy and closeness of being read only to struggle when they need to learn how to do it for themselves. A touching story about life's simple challenges as you grow up. Ever wondered what the childhood writing of Dickens, Austen, the Brontës and many other great writers was like? The study of early writing (and art) has been termed Juvenilia, drawing from the Latin meaning "things from youth". 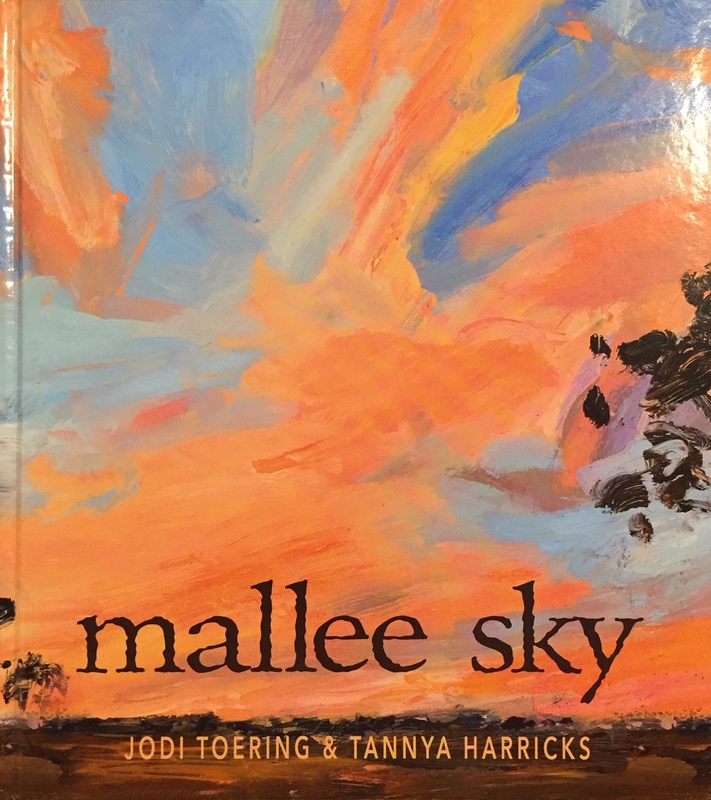 I have had the privilege of spending a number of years on the Editorial Advisory Board of the Juvenilia Press at the University of New South Wales, in this post I offer a sample of the wonderful work that has been produced, that high school teachers and their students will find fascinating. As students study this largely unknown material, they will gain insights into the work of great writers and perhaps gain inspiration for their own writing. 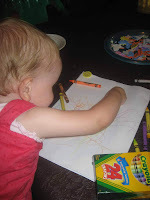 I have written already on this blog before here and here that children begin to write from a very young age. While the earliest attempts at writing of our children - even before the age of 12 months - is often seen as 'cute' and largely unimportant by some parents, many children from a young age develop a desire to do more than simply making their marks on paper; they begin to play with language and words, often in combination with their early drawings. Many great writers did, and some of this work survives. The Juvenilia Press was founded in 1994 by Juliet McMaster at the University of Alberta in Edmonton. Its aim was to study Juvenilia and to publish some of the early work of great writers. It moved to UNSW in 2001 when Professor Christine Alexander became the General Editor. Professor Alexander is a prominent Australian researcher, editor and writer on the Brontës and other 19th Century writers, including their juvenilia. Every publication from this not-for-profit press combines the early writing of great authors and a postgraduate or research essay on the work. These publications represent the scholarship and research of some of the world's leading professors of literature and their research students. In doing so, they preserve and shine a light on the early writing of great authors as an inspiration to young writers today. Juvenilia Press has published 66 works since 1994, some of which I reviewed in previous posts (here & here). The writers whose early work has been published include Jane Austen, Charlotte & Branwell Brontë, Louisa May Alcott, Charles Lutwidge Dodgson (Lewis Carroll), George Eliot, Margaret Atwood, Greg Hollingshead, Margaret Laurence, Marjory Fleming, Rudy Wiebe, Opal Whiteley, John Ruskin, Charles Dickens and many others. 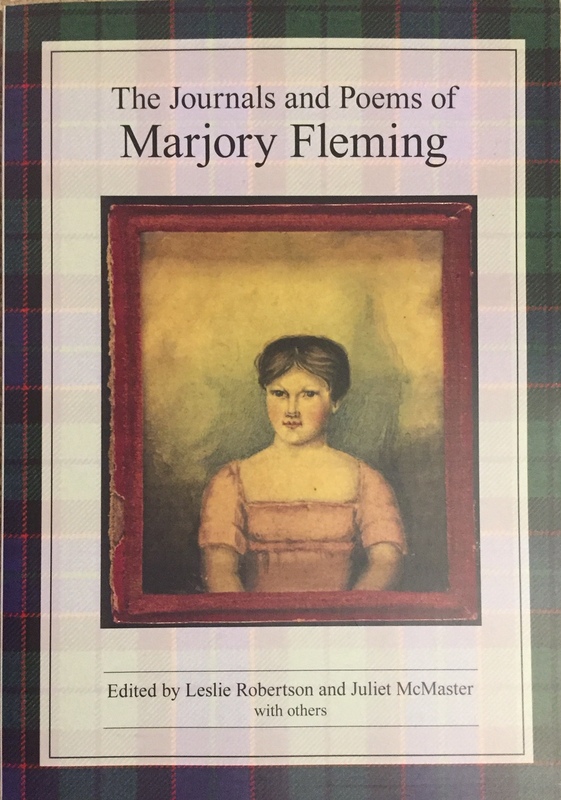 A self-confessed "little young Devil" who could throw spectacular temper tantrums, Marjory Fleming was nevertheless sanctified as "Pet" by the Victorians for her brief life and winning writings. In her engaging verse and journals she shares her wide reading, her delight in "rurel filisity" and her devotion to Mary Queen of Scots and Scottish history. Edited by Leslie Robertson and Juliet McMaster, with others. 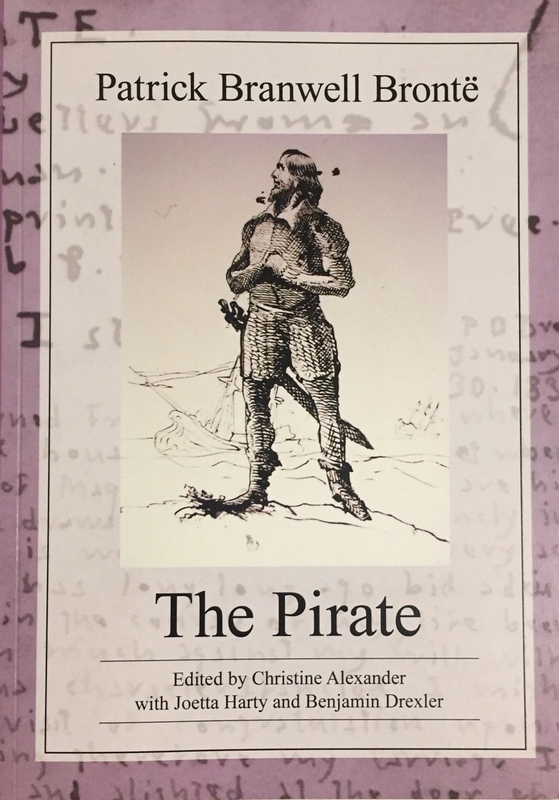 Written at the age of fifteen, The Pirate transports us into the dramatic imaginary world of the young Brontës, tracing the early career of Branwell's favourite hero (and later alter-ego) 'Rouge' to aristocratic demagogue. The young author and his hero both played pivotal roles in the creation of the Glass Town and Angrian saga. Edited by Christine Alexander, with Joetta Harty and Benjamin Drexler. The early twentieth-century Australian teenagers, Annie and Ida Rentoul, collaborated as writer and illustrator on a series of tales. 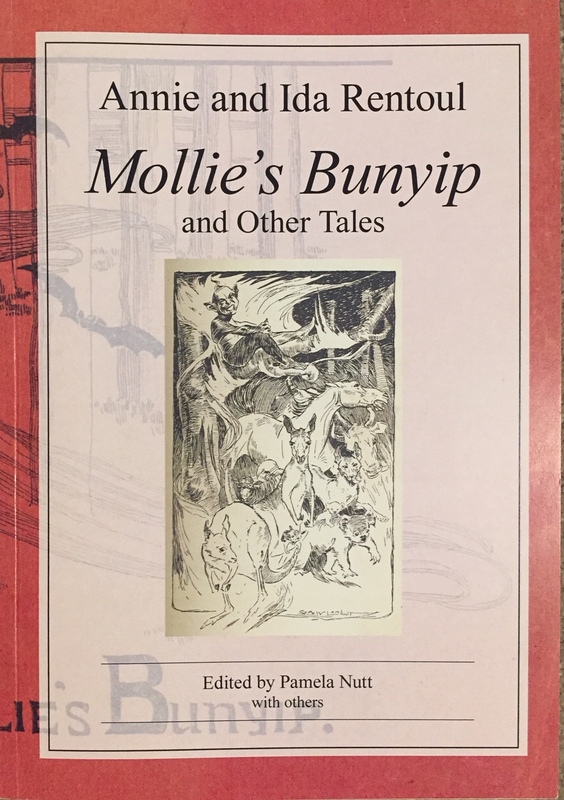 They chose to work in the fairy-tale genre at a time when there was a demand for such stories to have an Australian character. Ida’s career as writer, and particularly as illustrator, grew from these childhood publications, eventually leading to international acclaim. Anyone who has read or seen 'Little Women' will remember the play that the sisters performed within the work. 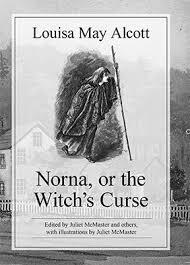 'Norna, or the Witch's Curse' is the real play, written when Alcott was just 15yrs old. In it she provides a farcical description in 'Little Women'. It is filled with fierce posturing and melodramatic action, Norna shows young Louisa and her collaborating sister Anna stretching their creative wings in poetic drama. Few readers of 'Little Women' would realise that the play in the book (and the film) was based on Alcott's play written, directed and acted out with her sisters when she was just 15. Dickens wrote of his childhood,"All these things have worked together to make me what I am". Among "these things" in his juvenilia are his genius for story telling, his creation of comic characters and his love of the theatre. Just like his later great work 'David Copperfield', they throw light on a young man in love, bursting with inventiveness and struggling to shape his ideas into the kind of public performance that would lead to fame. Christine Alexander has edited this publication with Donna Couto and Kate Sumner. It was timed last year to coincide with the 200th anniversary of his birth. The critical essay that precedes Dickens juvenilia reminds us that Dickens's amazing talent for storytelling was evident from a very young age. He was a child who loved being centre stage to tell stories, sing and entertain others. It is clear that Dickens wrote a great deal as a child, but much of it doesn't seem to have survived. However, over time some works have emerged from his late teens, including some of his early poetry and fragments of his first comic drama that he titled 'O'Thello'. This is a fascinating look at some of the early work of this great writer. Young Leigh Hunt's poems, early recognized as “proofs of poetic genius”, offer landscapes populated by happy schoolboys and errant knights freed from magical enthrallment. Already vivid here is Hunt's lifelong commitment to the betterment of his fellow man through friendship and communion with nature. In her diary of 1907, young Hope Hook records an exciting journey across Canada to Vancouver Island and back, by ship, rail and boat. Born to a family of artists, she is eager to observe the new country that will soon be her home, and all its people, flora and fauna. This work has been edited by Juliet McMaster. Pamela Nutt edited the work of Mary Grant Bruce with Year 11 students from Presbyterian Ladies' College in Sydney. This publication exemplifies the importance of pedagogy to the Juvenilia project. The illustrations are by Matilda Fay & Isabelle Ng. Mary Grant Bruce’s nineteenth-century childhood was spent in rural Victoria and throughout her writing career this landscape provided the setting for many of her stories. These early tales, written for the newspaper 'The Leader', demonstrate an understanding of the challenges of the Australian outback and introduce many of the concerns she would later develop in her highly successful fiction for children. For further information on all 66 books, as well as pricing and procedures to order single copies or class sets, contact the Juvenilia Press website for full details HERE.